To get an accurate read on a team’s effectiveness, we recommend team members complete our proprietary Team Assessment Survey (TAS), a powerful, in-depth feedback tool that measures team effectiveness in each of the eight components of the framework. The TAS is an online survey based on research with 1,500 teams from around the globe. It’s designed to help teams identify and leverage strengths, IDENTIFY areas of improvement, build and execute action plans, and set the stage for changes to team dynamics and performance. 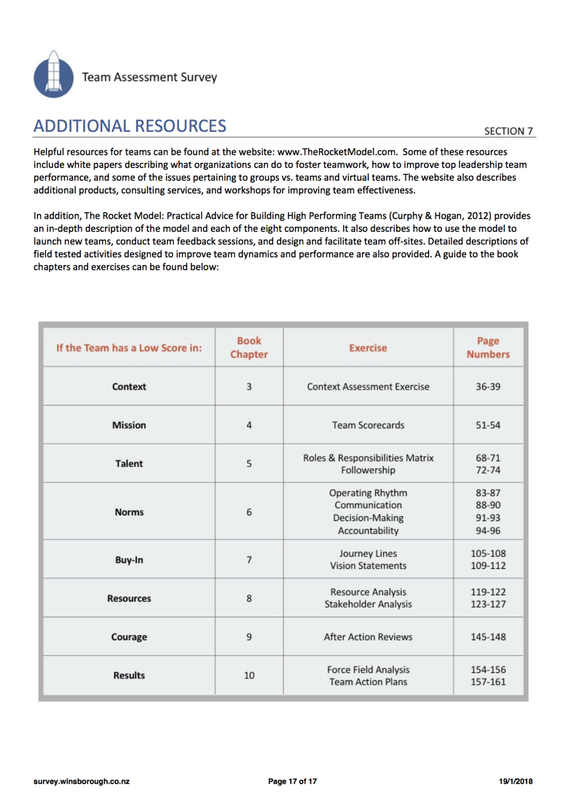 Based on the Rocket Model of team performance, the information provided in this report provides insight into what teams are currently doing well, need to improve, and how they compare to other teams across the globe. The model is both prescriptive and diagnostic, in that it provides a roadmap for newly formed teams on how to get started and for existing teams about what they are doing well or need to improve. More detailed descriptions of the eight Rocket Model components can be found below and throughout this report. Recognize the components that lead to high performance. Appreciate the differences between groups and teams. Gain insight into their areas of improvement. Understand how they stack up against comparable teams. Prioritize and focus on those areas having the greatest payoffs. Minimize the amount of time and money spent on ineffective team building activities. Create a common language for discussing team issues. Set initial benchmarks for later comparisons.